When Tim Green was drafted by the Atlanta Falcons in the first round of the 1986 draft, it fulfilled only one of his lifelong dreams. His other was to become an author, and he found a way to combine both. Green was one of the best football players in the history of Syracuse University, and he was also an English major who relished his creative writing classes. At the end of an eight-year NFL career he started writing books, and he has authored a series of football-themed kids’ books that have sold more than a million copies and made it onto The New York Times children’s best-seller list. Now, the former Falcons defensive end is visiting elementary schools with current NFL players, encouraging kids to read for 20 minutes a day. On a way to a book signing for his most recent work—Kid Owner, about a 12-year-old who unexpectedly becomes the owner of an NFL team—Green, who is also a lawyer, talked about forging a unique post-playing career. VRENTAS: How did you begin a career as a writer after you were done playing? GREEN: My career as a writer really began as writing suspense novels, which were what I loved to read. At the same time, my wife and I had kids, and as they started to grow up, I read to them every day. Starting with things like Goodnight Moon, and later, The Count of Monte Cristo. Right around 10 or 12 years ago, I was reading mostly middle-grade books because that was the age my kids were, when completely out of the blue I got a call from the creative director at Harper Collins Children’s. She had read a suspense novel that I wrote, and loved the book and loved my writing, and when she finished the book, she looked in the back and saw that I had been an NFL player. She had this idea: What if this guy took this writing style, which was short chapters, lots of action and cliff-hangers at the end of each chapter, and wrote for middle school-grade kids? She asked me if I had ever thought about it, and honestly I had, because I had been reading all these novels to my kids. I accepted the challenge, and I wrote Football Genius, using my own kids as the main characters, what they look like, how they act and their personalities. 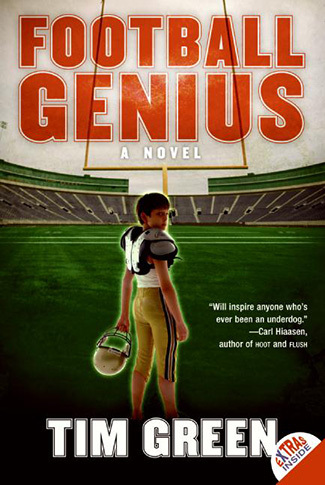 The publisher ended up putting my son, Troy, who is the main character, on the front of the book, which was fun, and Football Genius went onto the bestseller list. With the football books that I write, I try to find connections between a kid’s story and the NFL so that I can reveal the details of that world to the reader. It’s what I know that makes me unique as a writer. Green’s son, Troy, was on the cover of his first kids book. ​VRENTAS: How are you using your experience to promote literacy among kids? GREEN: I was asked by the publisher of Football Genius to visit schools and talk with students as part of my book tour. I started talking at schools, and I realized that my story about how I got there really resonated with kids. I was a dreamer, and I had two dreams: to be an NFL player and to be a writer. They both came true. I had a lot of credibility with the kids, and I realized that I could do something with that credibility, which was to really sell the idea to kids about the importance of character and education. Even though people know me because I was an NFL player, in my own world, character and kindness and education are far more important than playing in the NFL. I didn’t even really realize how powerful reading is. I read because I love books, and I love stories. But the more I was around educators, talking at over a thousand schools all across the country, I realized that educators everywhere know that students who read get smarter. I developed the catchphrase that reading is weightlifting for your brain, which is exactly what it is. If you want to be a great athlete you have to lift weights, and if you want to be the best student you can be, you need to be a reader. Students who read are also more compassionate. That makes absolute sense to me because reading is an exercise of putting yourself in someone else’s shoes, becoming different characters in different places, different religions and different skin colors, maybe having a disability. When we do that, even in a fictional world, it enables us to have sympathy and compassion and understanding for people who are different in our real world. That’s probably what I love most about books and about reading. That’s why I do what I do, and travel around and talk to kids. I certainly don’t do it for the money, although I get paid quite a bit. I use all speaking fees I get to buy books and give them to kids and schools and libraries that can’t afford them. It’s my passion. I haven’t cured cancer or created peace in the Middle East, but in a small way, I feel like I am helping. VRENTAS: The NFL has its Play 60 campaign to get kids to exercise. You’re trying to add Read 20? GREEN: In every good school system you’ll find teachers and principals who are encouraging their kids to read 20 minutes a day. It’s a huge grassroots movement, but no one has really grabbed that banner. I went to the NFL and said, wouldn’t it be cool, in addition to Play 60, to do a Read 20? I’ve been starting to do a pilot program where I connect with a current player, and we’ll go to a school and do a Play 60 event, and then we’ll go inside to the library with the same group of kids and do a Read 20 event. That message is really going to be impactful because they are looking at the active player—and me, to a lesser extent, the former player—and saying hey, these guys are NFL players, and they are telling us this is really important. We read for 20 minutes the beginning of my newest book, Kid Owner, and then give each one of the kids a copy of the book. We did it with the Bears and the Giants last year, and they loved it. Both [Giants running back] Rashad Jennings and [Bears tight end] Martellus Bennett wanted to do it again, and we’ve added three more teams this year: the Falcons, Cardinals and Cowboys. It’s growing and expanding, and I think it is a wonderful opportunity to enhance the message. • BENJAMIN WATSON GOES DEEP: A Q&A with the Saints tight end and newly published author, who is trying to change deep-rooted beliefs about race. VRENTAS: You mentioned your two goals: to be a writer and an NFL player. You also had the forethought to attend law school while you were still playing. Many first-round picks don’t get an early jump on the next phase of their lives. What made you decide to take those steps? GREEN: My mom was a teacher, so I heard all the time about the importance of education, and I guess I believed it. After my first year, I looked around and realized that time goes pretty fast. I saw older players who were great players, and they were at the ends of their careers, and I realized that is going to be me in a heartbeat. So I just wanted to use the time that I had in the offseason to educate myself further. That’s another point of my message to kids: the accomplishments you have in education, they stay with you for the rest of your lives. Sports always ends before you want it to. VRENTAS: How did you balance law school with your NFL career? GREEN: I would only go in the spring semester, so it took me six years instead of three. I went back to Syracuse in the offseason. I would schedule my law classes in the morning, so I would get up and go to school and have lunch, and then I would train all afternoon. Then I would go home at night, and my wife and I started having kids, so I would do stuff with the kids, watch a movie or take a walk, and then my wife would go to sleep and I would get my law homework done. And then I would start to write. I would write every night because I was working on my first novel, so I was really, really busy. But I loved it, I actually enjoyed law school, and I loved writing. The training, I’ll admit, I didn’t love, but it was my job—my only paying job. 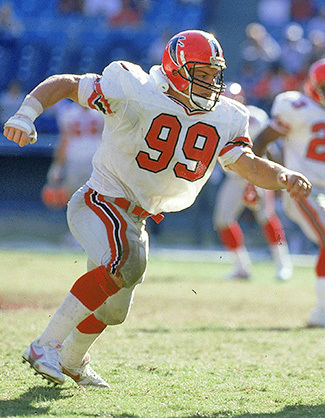 Green, the 17th pick of the 1986 draft, played all eight of his NFL seasons with the Falcons. ​VRENTAS: You have also written a book about your experiences playing in the NFL, called The Dark Side of the Game, which touches on, among other topics, the physical brutality of the game. Have you had any lasting effects from your playing career? GREEN: So far, so good. I have some cognitive decline that so far is just commensurate with my age. I worry a little bit about it, but I don’t regret playing. It’s great to think, Gee, I wish they had those concussion protocols in place when I was playing, but they didn’t. I played in the ’80s; if you went back 20 years from then, people were dying playing football because of head injuries and the helmets were so bad. The game has always had an element of danger to it, and it always will. The league and the players are constantly trying to make it safer and make it better, but it’s just part of the reality of being an NFL player. I’m hopeful that I am not going to have any long-term impact. Maybe I would feel differently if I did have that. VRENTAS: You wrote about having a dozen concussions. Were those all in the NFL? GREEN: I don’t really know how many I’ve had. I stopped counting after 10. They weren’t all in the NFL. I honestly don’t know how many I had in the NFL. I had a lot, at a lot of different times, and I don’t think with any of them I ever missed any time. Even the ones where I was blacked out or, a couple of them, they caused amnesia. I remember one in college and one in the NFL where I just had no idea what happened. I remember watching the game film the next day and seeing what happened, but not remembering that or most of the rest of the game. And there were other ones where I was knocked out and you come to and they are helping you off the field. When your head clears and your wits are about you, they ask, “How do you feel?” and you say, “I’m great; I’m fine.” They ask how many fingers they are holding up, and you say, three. Alright, he’s good to go, go back in the game. Now people cringe. They wouldn’t do that now. • ‘YOU JUST DON’T THROW AWAY ALL THAT TRADITION’: Vito Stellino has covered the NFL for 51 years and seen it all: scandals, dynasties, broken hearts and comebacks. Here’s what the Hall of Fame scribe has learned about the game over the decades. VRENTAS: What ultimately led to you retiring? GREEN: A bunch of things happened all at the same time, and they were all pretty important. I was offered a four-year contract to broadcast NFL games by Fox Sports, and at the same time I had published my first book and it did well. I had a three-book contract, and I had the TV contract, and I was graduating from law school. And in my last year, I injured my knee and had two different surgeries to remove part and then all of the medial meniscus in my right knee. It’s not that I couldn’t have kept playing, and there were moments when I really thought about throwing everything else aside and going back because I really did miss it. But the opportunities, and the way that everything came together, I knew that I was never going to have that perfect storm again so I made that move. VRENTAS: Are you still involved with the Falcons at all? GREEN: I follow them closely, and we go down to Atlanta for a couple games a year and maybe pick up one game on the road. We are diehard Falcons fans and we’ve been that way ever since. I think it is really more my kids than me. I’m a Falcons fan, don’t get me wrong, but my kids are just beside themselves. When the team loses, they are depressed. This season has been fun; last year was not fun. [Owner] Arthur [Blank] is a friend and a wonderful person, and he has been very generous to me and to my family. He wasn’t the owner when I played there, but I got to know him when I was a broadcaster. When I came up with the idea for Kid Owner, maybe it was being around Arthur Blank and his family, and I just thought, wow, one of these kids could own the team. VRENTAS: You are still very involved with Syracuse football. Would you ever consider coaching at the college level? GREEN: I don’t think so. I am coaching my 9-year-old son now. No, I’m not really a coach. I shouldn’t say that—I know how to run a program and get really good coaches and have a great weight program. I think that a lot of being a great head coach is really just the staff that you have around you. You have to get really good coordinators and really devoted position coaches and just let them do their thing. Create a structure where they can do their thing. I don’t think it is realistic to think I am going to coach college football, but if I had the right assistants, I could do it. VRENTAS: You can stick to writing. What about books always appealed to you? GREEN: Books for me just had a magical quality, and I just always wanted to be able to create that. I wanted to be able to create a world on paper and bring characters to life on paper. I didn’t know that the process was going to be as enjoyable as it is to me, because I really enjoy writing. I enjoy it as much as I enjoy reading. I don’t think you can be the best writer you can be unless you are doing a lot of reading as well. It’s a lot of work, but I really enjoy it, and I love doing it.